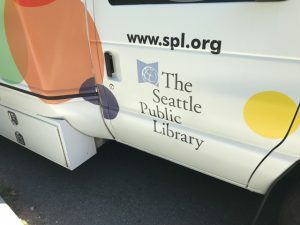 Betsy, at the Seattle Library Bookmobile welcomes children from the Community Center in Meadowbrook once a week. 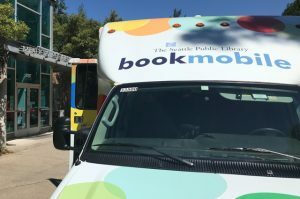 Because of the great distance (in ‘kids ft’), from the Wedgwood / NE Library to south and Lake City Library to the north, this city program site qualifies for a weekly Summer visit involving the children in this MBCC program. A ‘feel good’ and ‘great thing’, all at one time. 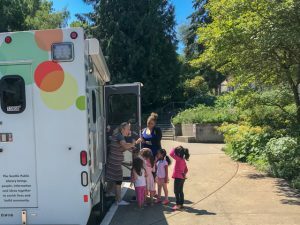 Additionally, with the temporary closure in Lake City of that Seattle Library site, the Bookmobile will be there, at the Lake City Farmers Market days on Thursdays, which seems like a great alternative. The local market is a great local getaway excursion; treat yourself. 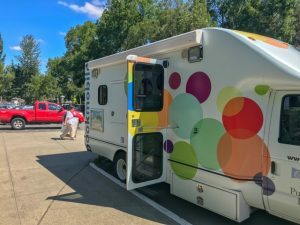 With all the active stakeholders in the Northeast advocating and volunteering, the inclusive and expanding circle of care continues. Big circle!